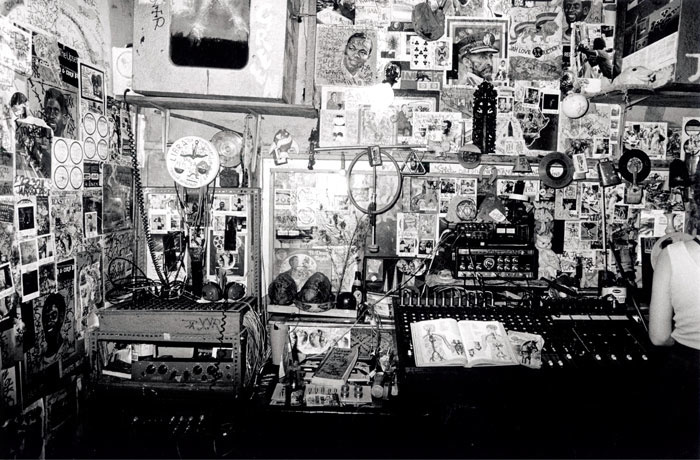 Some of the most famous dub mixes of the '70s came from Lee 'Scratch' Perry's famous Black Ark Studio in Kingston, Jamaica. There are lots of reasons to teach yourself the art of dub mixing. It's fun, it's creative, it puts your engineering skills centre stage - and it might even make you some money. Dub started in Jamaica in the late '60s with engineer Osbourne Ruddock, aka King Tubby. Either way, Jamaica has always been a sanctuary for this type of music, and hundreds of great dub records have been produced and mixed there. Jamaican producers have been pioneers in sound engineering, with an exceptional and daring capacity to innovate in sonic terms. They all shared a fresh approach towards the use of tape machines, mixers, effects and experimentation, never scared to pick up a screwdriver and open up the equipment to fix it or alter its sound. Some of the most important producers in the history of dub mixing include the aforementioned Osbourne Ruddock, Lee 'Scratch' Perry, Adrian Sherwood, Mad Professor, Jah Shaka, Augusto Pablo and Dennis Bovell. Next month, we'll be talking in depth to Mad Professor, who is perhaps the leading dub mixer working today, but before that, let's look at what dub mixing is and how you can do it in your studio. It was during the early '90s that I first got into reggae and dub music. The reason why I fell in love with dub wasn't just the music itself, nor the Rastafarian ideology or the herbal elements associated with this culture. For the first time ever in my working career as a sound engineer, I was aware of the creative central position that I occupied when mixing dub. It was as if the mixing board became a real musical instrument. I was a performer and my skills on the mixing desk were the centre of the attention. When you mix dub you are the driving force and you are expected to perform. I was a teacher back then, and I also came to realise that dub mixing techniques were a really useful tool for teaching my students about recording and signal flow. Above all, they teach us how to enjoy using the mixing desk as a genuinely creative tool. Back in the days when I was a dub producer and session player, I was working for a company called Lion Music. It was a great experience, as it enabled me to learn as much as I could about the world of analogue just before it all got swallowed by the digital wave. Big tape machines, large consoles, rusty wah-wahs and a good dose of noise: I loved it! Lion Music managed to develop a considerable catalogue within the first year of trading, because every album that the company produced was being remixed, recycled and reworked. Every production would be mixed for the mainstream reggae market, but at the same time, versions, remixes and instrumentals were also being produced using virtually the same material, just by reshuffling the arrangements. The rhythms used on one record could be used to produce songs for other artists, but the bass lines and chords might change. A dub album would also appear out of the blue from one day to another. I once asked Ronnie Lion, the label owner, where a dub album had come from, and he said that he had had time the night before to dig out a few tapes and make a new dub CD overnight. The moral of the story is that dub mixing allows you to create marketable extra material quickly and easily. When your studio is nice and quiet, try a bit of dub mixing: it's endless fun and your skills on the board will quickly grow, as will your catalogue of instrumentals! If you offer dub mixing as a service to your clients, they might well think that the results justify paying you for a few extra hours of studio time. Likewise, if you take the time to mix PA and instrumental versions of your own tracks, they will be very useful in future. Who knows, you may come across a publisher or a singer who needs backing tracks, and the cash is waiting. The backbone of dub is reggae music. A dub track is usually a remix of a reggae track, and before we can move onto the mixing techniques used in dub we need to get to grips with the basics of a reggae rhythm. There are a number of fundamental elements that are common to most reggae rhythm tracks. In reggae there are two fundamental rhythms: Rockers and Steppers. 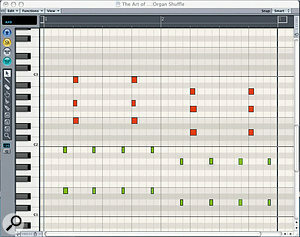 I've illustrated these with screen captures from the piano-roll MIDI editor in Logic. 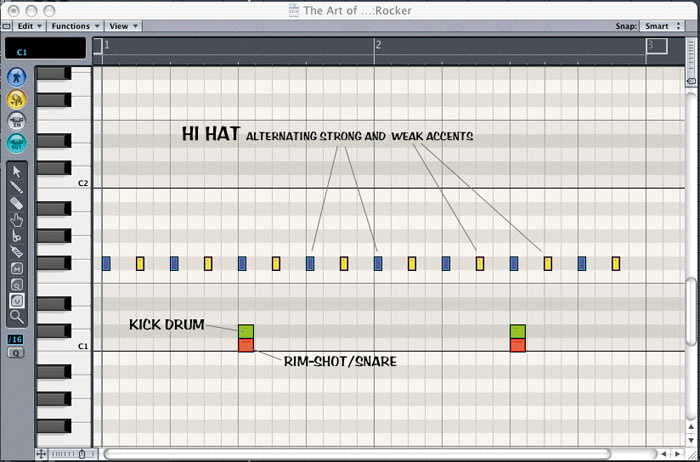 In the Rocker style, or 'one drop', the drums can be programmed as in the screen to the left. 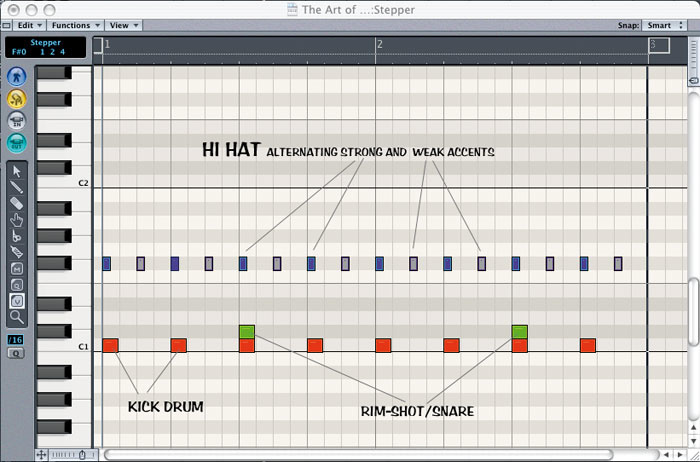 In the Stepper, by contrast, the basic drum rhythm is as shown in the second screenshot, below left. 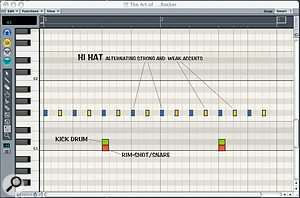 Once you have programmed the drums, you are ready to add a bass line. Reggae bass lines can't be explained quickly. I had plenty of practice standing at the side of the bass player while touring Europe as lead guitarist with various roots artists, but in your case if you need to research further I suggest that while you listen to some dub music you focus on the bass line, try to reproduce it, and play along with a bass keyboard sound or guitar to get a feel for it. Reggae bass lines can vary from very basic sequences to strangely syncopated patterns. In both cases they go hand in hand with the drums, they develop in laid-back fashion, often with accents that fall away from the main beats, and they sit high in the mix. Often they also carry a militant feel (as the Jamaicans call it, meaning military, or martial). 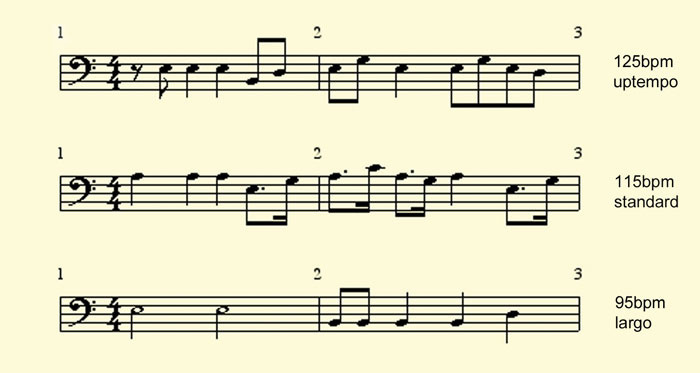 The score overleaf shows three examples of typical reggae bass lines at different tempos. The chop is usually played by the piano and/or the guitar and it's placed off the beat. In a reggae arrangement it is always there, and it acts like the piston of a steam engine pushing and pulling against the other instruments. In dub the chop is equally important, but it is not used at all times, as we will see later. The job of the keyboard player isn't just to play the chop. Often he or she will also perform a shuffled organ pattern, which is sometimes called the 'bubble'. This is usually a double-time element and changes our perception of the rhythm. The screenshot, right, shows a programmed arrangement with a typical chop (in red) and shuffle (in green). Reggae uses many more instruments on top of the basic rhythm tracks, and in dub mixes producers like to add or turn up in the mix other elements, such as lead guitar, flute, brass, melodica and percussion. Reggae music has taken elements from R&B as it's evolved, so if in doubt, you will usually find that it works to keep the lead instruments and brass quite bluesy. Reggae voice patterns are very free. The phrases can move about, alternating accents on and off the beat. The voice and sometimes other lead instruments are set to push against the beat and reaffirm it. It all revolves around the chop, which is like a balustrade on which to lean. In reggae the voice is essential, but as we will see, in a dub remix it takes a secondary role. It is often muted to reveal the underlying texture and to make room for other parts, including echo effects and sporadic reverb shots. Setting up a feedback loop with a delay will result in unpleasant digital phasing. To minimise this, you can set up an EQ or filter on the effect return channel to filter out some high frequencies. This will prevent the frequencies most affected by the phasing from entering the feedback loop. You will also have problems with the SPL of the echo returns increasing to the point of digital distortion. Inserting a limiter in the return channel will allow you to experiment with the delay without the constant fear that your speakers (and your ears!) will suddenly blow. The nature of small digital desks and DAW systems makes it difficult to do real-time mixing, because you're constantly having to change pages, switch windows or mute with the mouse. To overcome these problems you can use automation, or set up your DAW's mixing window to include the tape returns as well as effects returns. You can set up a delay plug-in with the right delay time and feedback and automate the aux sends as you wish. Instead of playing a musical instrument, the dub master plays the mixing board. In effect, dub turns the mixing process into a live performance happening in real time. With a digital recording setup it is tempting to use automation to record all your moves, to make it possible to go back and tidy up later, but in the purest form dub wants to be mixed in real time and preferably on an analogue board. Changing pages on a digital desk or switching windows on a PC takes the juice out of the fruit. So let's see what are the creative techniques available to us. This technique is a classic example of using equipment in ways it wasn't designed to be used! Set up an auxiliary send on your desk, and route it to a delay unit. 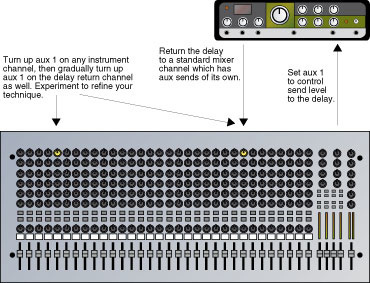 Set the delay time to about 0.7 seconds and turn the feedback up until each repeat is heard four or five times. Route the output signal from the delay unit back to the desk on a full stereo channel (or a pair of mono channels) that has an aux send on it, rather than on dedicated effect return inputs, which do not always have auxiliaries. Play back a sequence or a bit of a recording, turn up the aux send, and you'll hear some delays and echoes developing, just as you would when using delay in any mixing session. Now here is the trick: gradually turn up the aux send on the return channel(s), so that you're sending the returned signal from the delay unit back to its own input. As you turn up the aux send, listen out for an increase in the feedback level. When you hear the echoes picking up, mute the source channel to avoid interfering with your process. Finally, try playing about with the aux send pot on the return channel and see how every move up or down affects the feedback. It's quite easy to lose momentum, but practice will help. It's a bit like trying to keep the engine of an old car going just after you start it in the morning on a winter's day — you need to adjust the accelerator to prevent stalling! 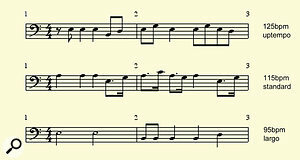 An example of a reggae keyboard part playing both the 'chop' and the 'shuffle'. Photo: Adrian Boot / RetnaThe delay time should be set so as to develop in triplets, and it will revolve around the beat even after it starts to go gradually off sync. This technique works best with an analogue desk. It can be done in a digital setup, but you need to be careful, as I explain in the 'Digital Dub Mixing' box. Another effect that is used a lot in dub mixing is reverb, but again, it's the opposite of the usual 'set and forget' approach. The dub way of doing it is much more dynamic! 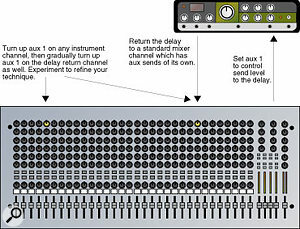 A reverb is set up on an auxiliary send, and as the track is playing, the send level is altered for different instruments. For instance, you can turn on the aux send just for one single hit on the snare or the chop, and then revert to its original position. First the snare is right here with you, dry and present, and suddenly you hear it shooting off the planet at great speed. I call it the room shot! The shots alternate, and an accomplished dub producer knows exactly when to insert echoes, swirls and reverb shots in strategic places. 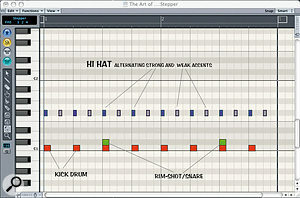 Flangers and phasers are great effects on piano or guitar chops, hi-hats and other instruments. The filtering effect develops in time and changes also according to the dynamics of the input signal. In this case, you can just set it up and watch it do its thing, but it also works very well to set a phaser on the delay's return channel. As we mentioned above, why not try routing an effect return channel into another effect or sending reverb to it. For example, apply reverb to the delay return, or plug a phaser into the delay return. Another idea is to insert a noise gate through the return channel of a reverb or delay and tweak the gate's threshold until it starts 'skattering'. Finally, muting can be used as a creative tool. It allows you to make decisions about the arrangement without rewriting the song structure. You can cycle an eight-bar loop of the song, and, using the mutes, create a well-structured backing track by bringing different elements of the arrangement in and out. Learning to switch mutes a fraction before the beat is an art in itself. Software-based recorders allow you to automate all the switching and aux sends, but if you can it's still worth trying the real-time approach, which is more spontaneous and can bring you new ideas. If you want to offer dub remixing to a client, all you need from them are the multitracks — in other words, separate audio files for drums, bass, guitars, keys, voices and so on. The first thing I do is to align all the parts and check that everything is synchronised. The way I work is simple: I like to create a 16-bar loop containing all parts playing simultaneously. That doesn't mean that they will play back at the same time in the dub mix, as during the mix I will use the mutes to bring parts in and out as my musical perception dictates. For example, if I'm getting a little bored I start switching instruments in and out or applying effects to the snare; and as the excitement rises I may improvise a calmer section of the mix by muting instruments such as the snare drum or the bass. Often at the beginning of the mix I fade in a keyboard pad and bring in a hook from the vocals or guitars with effects, and when it feels right I unmute all the tracks and see what happens. After I've introduced the key element of the song I start igniting the real fireworks in terms of effects, until five minutes later it's probably time for a fade-out and a cup of tea (or Jamaican equivalent).